John Treacy speaking at Bernard Dunne's appointment as high performance director for the Irish Amateur Boxing Association. THE IRISH AMATEUR Boxing Association (IABA) has been warned it will have its funding cut from 1 July unless it resolves “significant issues of concern”. In a strongly-worded statement issued today, Sport Ireland says that there are “ongoing governance issues within the organisation” despite talks between the two bodies yesterday. Among the outstanding issues for the IABA to resolve include; the autonomy of new high performance director Bernard Dunne [whose team selection for this month's European Championships was challenged by the IABA's Central Council] and the introduction of a proposed new rule book. There is also the significant issue of who is the head of the IABA. The IABA are funded to the tune of €1.1 million annually by Sport Ireland and have received 75% of this year’s money which ensures it is fully-funded until September. Sport Ireland would like to acknowledge the progress made by the Irish Athletic Boxing Association (IABA) in recent months. 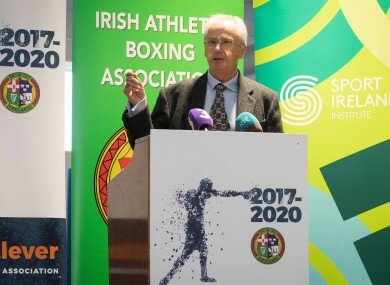 Developments led by the Board of the IABA include the publication of ‘Boxing Clever’ the IABA’s new strategic plan, the completion of the 2016 Rio Review and the implementation of two key recommendations of that review – the relocation of the High Performance Unit to the Sport Ireland Institute and the appointment of Bernard Dunne to the position of High Performance Director. “However there remain significant issues of concern at the IABA. The Board of Sport Ireland met in Dublin on Friday, June 2nd, to discuss the developing situation within the IABA. The Board of Sport Ireland deemed that the IABA is in breach of its terms and conditions of funding and took the decision to suspend all funding to the IABA, effective from July 1st, unless certain criteria are satisfied. In order to satisfy the Board of Sport Ireland that it has successfully addressed the breach of the terms and conditions, by June 30th the IABA must introduce the proposed new Rule Book which is required to further implement ‘Boxing Clever’ and the Rio Review. Further it must address the inadequate governance arrangements which are giving rise to the current difficulties. “Representatives of Sport Ireland met with Board members of the IABA on Tuesday June 6th to discuss ongoing governance issues within the organisation. Sport Ireland recognises Joe Christle as the Chairman of the IABA and has no reason to believe that there is another Chairman of the organisation or an alternative board. At yesterday’s meeting the IABA representatives assured Sport Ireland of their commitment to implementing a new Rule Book for the organisation as per the strategic plan and would introduce this within the prescribed timeframe. “The IABA has to date received 75% of its Core and High Performance funding for 2017 which means the organisation is fully funded until the end of September. This decision will not impact Sport Ireland’s direct athlete investment through the International Carding Scheme in 2017. Email “Sport Ireland issue Irish boxing with funding cut threat”. Feedback on “Sport Ireland issue Irish boxing with funding cut threat”.